Made these yummy cupcakes with my little one last night. Enjoy! Preheat oven to 350 F. Line your cupcake pans with 18 liners. In a stand mixer fitted with the paddle attachment, beat the butter and both sugars on medium speed until fluffy, about 5 minutes. Meanwhile, sift the flour, baking powder, baking soda, cinnamon, ginger, nutmeg, cloves, and salt into a medium bowl. One at a time, add the eggs to the mixer, scraping down the sides of the bowl after each addition. Alternate adding the flour and milk mixtures, beginning and ending with the flour. Add the pumpkin and beat until smooth. Divide the batter equally between the cups. (They’ll be about 3/4 full.) Rap the filled pans once on the counter to release any air bubbles. Bake the cupcakes until a toothpick inserted into the center comes out clean, about 20 to 25 minutes. Transfer the pans to wire racks and after 5 minutes, remove the cupcakes to the racks to cool completely before frosting. Went to happy hour last week and had an order of these and then another. Delish! Place a small chunk of cheese in the center of each date, wrap with bacon and secure with toothpick. Arrange dates upright on baking sheet, making sure cheese will stay inside once melted. Bake until bacon is crisp and brown, about 20 minutes. This torte is a specialty for Greek Orthodox Easter. Delicious! Greek honey, for serving (optional). 1. Heat oven to 375 degrees. In a food processor, combine feta, cottage cheese, eggs, dill, 2 tablespoons Romano, the nutmeg and pepper and pulse just to combine (you can also use a large bowl and a fork). Mixture should be well combined, but still chunky, not smooth. 2. Sprinkle remaining 2 tablespoons Romano into a Bundt pan. Drape a sheet of phyllo on top of Bundt pan, poke a hole into phyllo where center tube is and push phyllo into pan to line it. Do this with another phyllo sheet, but place it perpendicular to first sheet. Continue adding phyllo sheets in this crisscross manner until all sheets are used. Edges of phyllo should hang over edges of pan. 3. Scrape cheese filling into pan, and fold edges of phyllo over filling. Using a sharp knife, poke many holes (at least 20) in dough that reach all the way to bottom of pan. Slowly pour melted butter over torte; some butter will seep through holes and some will remain on top of dough. 4. Place Bundt pan on a baking sheet and bake for about 1 hour 15 minutes, or until torte is puffy and golden brown. Allow torte to cool in pan for 1 to 2 hours before inverting onto a plate and slicing. Serve warm or at room temperature, with honey if desired. With Passover just around the corner, we thought that this step by step guide would come in handy. Followed by a recipe for soup. 1. Combine egg yolks, club soda, chicken fat, chives, salt, and pepper. Whisk to blend. Stir in matzo meal. Stir in 1/3 of the whipped egg whites, using a whisk to loosen the batter. 2. Fold (don’t stir) in the remaining egg whites in 2 additions. For best flavor, salt the cooking water as you would for pasta. 3. For uniform little dumplings, use a melon baller or a 1-teaspoon measuring spoon. Dip the melon baller in the boiling water first to heat it, then quickly scoop out some batter (it doesn’t have to be a perfect round). Submerge thescoop in the water, and shake it gently to release the batter. 4. To test a matzo ball for doneness, cut it open. When it’s completely tender, the color will be the same all the way through. Is it darker in the middle? Keep cooking. When in doubt, err on the side of more cooking. Read about this in DesignSponge and have added it to my wish list of things I’d love to do. Outstanding in the Field creates a wonderful culinary experience bringing together locally grown food, amazing wines, and beautiful settings. One of my favorite things about St. Paddy’s Day is McDonald’s Shamrock Shake. Here’s a copycat recipe. 1. Combine all ingredients in a blender and blend on high speed until smooth. 2. Stop blender to stir with a spoon if necessary to help blend ice cream. 3. Pour into 12-ounce cups and serve each with a straw. 4. Happy St Patrick’s Day! Capirotada (pronounced: kä-pe-rô-tä-thä) is a common Mexican bread pudding that is traditionally eaten during Lent. It is generally composed of toasted french bread soaked in a mulled syrup, sugar, cheese, raisins, and walnuts. The syrup is generally made with water, piloncillo (Mexican brown sugar), cinnamon, and nutmeg. It is best served warm, but many choose to let it chill. This bread pudding is traditionally served as a dessert, but the unusual addition of savory garnishes — roasted peanuts and aged cheese — also makes it a wonderful breakfast or brunch dish. Gradually pour warm syrup over bread slices, allowing some of syrup to be absorbed before adding more. Sprinkle raisins, almonds, and peanuts over. Cover dish with foil and bake until bread is slightly softened and syrup is bubbling, about 25 minutes. Place 2 bread slices on each plate; spoon some of syrup, raisins, and nuts over. Top each with queso manchego. Serve with crema mexicana, if desired. *Light yellow, semi-soft mild cheese that is different from the aged Spanish cheese of the same name. Substitute mild cheddar, Monterey Jack, or Muenster. **Cultured Mexican cream with a slightly nutty flavor and consistency of thin sour cream. Everyone from Anderson Cooper to Martha Stewart has raved about this pie. They don’t call it Crack Pie for nothing. This will run you $44.00 at Momofuku Bakery & Milk Bar. Even at that price they sell out and mail out all over the country. We think it’s the perfect Sunday recipe. We love the idea of using seasonal ingredients in our cooking. Here’s a guide of fruits and vegetables that are best in Spring. There is a delicious pasta recipe to follow. Enjoy! ARUGULA (a.k.a. rocket) is a cool-weather crop. Long days and warm weather make it bolt, or flower, and bring an unpleasantly bitter flavor to the leaves. Wild arugula is foraged in spring and again the fall. Cultivated arugula is grown year-round, thanks to coastal, temperate growing areas and winter greenhouses. CARROTS are harvested year-round in temperate areas. True baby carrots – not the milled down versions of regular carrots sold as “baby carrots” at grocery stores – are available in spring and early summer. CHARD grows year-round in temperate areas, is best harvested in late summer or early fall in colder areas, and fall through spring in warmer regions. Like all cooking greens, chard turns bitter when it gets too hot. CHERRIES are ready to harvest at the end of spring in warmer areas. Sweet cherries, including the popular Bing and Rainier varieties, are available from May to August. Sour cherries have a much shorter season, and can be found for a week or two, usually during the middle of June in warmer areas and as late as July and August in colder regions. FAVA BEANS are a Mediterranean favorite available in the U.S. from early spring through summer. FENNEL has a natural season from fall through early spring. FIDDLEHEADS are available in early spring through early summer depending on the region; these young wild ferns are foraged. GARLIC SCAPES/GREEN GARLIC are both available in spring and early summer. Green garlic is immature garlic and looks like a slightly overgrown scallion. Garlic scapes are the curled flower stalks of hardnecked garlic varieties grown in colder climates. GREEN ONIONS/SCALLIONS are cultivated year-round in temperate climates and come into harvest in the spring in warmer areas. GREENS of all sorts some into season in warmer regions. KIWIS grow on vines and are harvested winter through springing warmer and temperate areas. KUMQUATS are still available in very early spring. LEEKS more than about 1 1/2 inches wide tend to have tough inner cores. The top green leaves should look fresh – avoid leeks with wilted tops. MINT starts thriving in the spring. MORELS are foraged in the wild in the spring. Look for firm specimens at specialty markets and foragers’ stalls at farmers markets. NETTLES are sold at markets by foragers and farmers, but most people get theirs the old-fashioned way: foraging them themselves. If you’re lucky they’re growing as “weeds” in your garden. NAVEL ORANGES hit the end of their season in the spring. RHUBARB is the first fruit of spring in many areas – look for heavy stalks with shiny skin. SPINACH season varies with your climate – year-round in temperate areas, summer and fall in cooler areas, fall through spring in warmers regions. STRAWBERRIES are mostly grown in California or Florida, where the strawberry growing season runs from January through November. Peak season is April through June. Other areas of the country have shorter growing seasons that range from five-months to as short as a few weeks in the coldest areas. SWEET ONIONS have slightly different seasons, but in general they are available in spring and summer. Turnips have a sharp but bright and sweet flavor. Look for turnips that feel heavy for their size. 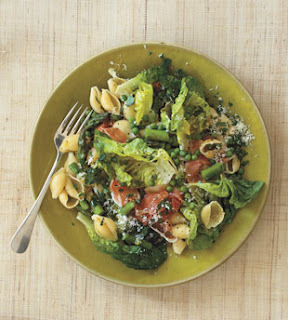 Wilted butter lettuce is a surprisingly delicious addition to this pasta dish. Using campanelle or medium shell pasta is key here: The pasta catches all of the little ingredients, like the sweet green peas and the salty prosciutto. Melt butter with 2 tablespoons oil in heavy large skillet over medium heat. Add onions and shallot. Sprinkle with coarse salt and pepper. Sauté until tender (do not brown), about 8 minutes. Add wine; increase heat to medium-high and simmer until liquid is reduced to glaze, about 3 minutes. Add broth and bring to simmer; set aside. Cook asparagus in large pot of boiling salted water until just tender, 2 to 4 minutes, depending on thickness of asparagus. Using skimmer or slotted spoon, transfer to large bowl of ice water. Return water to boil. Add peas and cook until just tender, about 2 minutes. Using skimmer, transfer to bowl with asparagus. Drain vegetables. Return water in pot to boil. Cook pasta until tender but still firm to bite, stirring occasionally. Drain, reserving 1 cup pasta cooking liquid. Meanwhile, reheat onion mixture. Add lettuce and stir just until wilted, about 1 minute. Add drained asparagus and peas; stir until heated through. Add pasta, 1 cup Parmesan cheese, and parsley to skillet with vegetables; toss, adding reserved pasta cooking liquid by 1/4 cupfuls if dry. Season with salt and pepper. Transfer pasta to large shallow bowl. Sprinkle prosciutto over; drizzle with olive oil. Serve, passing more cheese alongside.